With a board reading [8c][js][10c], Mark Lieberman is all in holding [qh][qd] against Andrew Gileno holding [kc][jc]. The [6s] turn was safe for Lieberman, but the [7c] on the river gave Gileno the flush, and Lieberman was eliminated one short of the final table. Steven Tabb raised to 17,000 in the cutoff and Raj Patel shoved all in on the button. Tabb asked the dealer to pull in the 17,000, and asked for a remaining count. Upon hearing the total he would need to call, (94,000) Tabb thought for a moment before he eventually called. Patel was ahead holding [8s][8c] against Tabb's [qh][jh]. But Tabb had turned a flush draw, and hit a jack on the river to eliminate Patel in 12th place. We are now on the final table bubble and the remaining ten players are now hand for hand. On a board reading [5h][8h][kc][4s], Solomon Yi is all in and has been called by Steven Tabb. Tabb turns over [ad][kd] for a pair of kings. But Yi turned the straight holding [7c][6s]. The [6d] came on the river. Yi is now sitting with 830,000 and Tabb with 1,200,000. The remaining 19 players in Event #12 ($400 NLH 6-Max) are currently on break. They will return to play level 16 (1,500/3,000 blinds with a 500 ante). There are 9 players left in Event #13 ($300 7 CARD STUD HI LO 8+). They are also on a ten minute break and will return to play Level 16 (500 ante, 1,000 bring-in, 3,000/6,000 limit). The remaining 13 players in Event #11 ($1,200 NLH Multi-Flight) are currently playing level 20 (4,000/8,000 blinds with a 1,000 ante). They will play either until a final table (ten remaining players) is reached or until the end of Level 22. On a board reading [6d][jd][kc] John Matson got it all in and was called by Steven Tabb. Matson turned over [ad][as], but unfortunately for him Tabb had flopped two pair holding [kd][jc]. The [jh] turn gave Tabb a full house, and the [5c] river sent Matson home in 14th place. Tabb is now sitting with 1,500,000 in chips, and is still the chip leader. On a board reading [4d][3c][8c][10c], Bobby Corcione shoved all in and Steven Tabb quickly called. Tabb turned over [ac][7c] for the nut flush. and Corcione turned over [kd][10d] for a pair of tens. The river came the [6h]. Corcione was sent home in 21st place with a $3,783 payday. Steve Tabb is the current chip lead at 680,000. Alessandro Lomagno raised to 20,000, Yuliya Makarova shoved all in, and Lomagno called. The flop came [9s][kh][9d], giving Lomagno quads. Makarova needed running aces in order to remain in the tournament. Unfortunately, the [kd] turn and [8s] river were of no help, and Makarova was sent home in 25th place with a payday of $2,910. There were 118 entries in Event #12, bringing the total prize pool to $40,061. A player in the cutoff raised to 8,000. Michael O'Connell shoved all in on the button for 23,100. Bobby Corcione called in the small blind, and the cutoff tank folded saying, "I'll let you two battle this out." O'Connell's tournament life was at risk holding [qc][qd] against Corcione's [kc][kc]. The board ran out [8c][10c][4d][2s][js]. O'Connell would be sent home in 28th place, just shy of the money and Corcione chipped up to 325,000. All remaining players are now in the money and guaranteed a minimum of $2,910. Christopher Pustelnikas raised to 7,000 in the cutoff and both blinds called. Both blinds checked the [kh][5d][8d] flop, and Pustelnikas continued for 13,000. The big blind raised to 27,000, and "Worldwide John" shoved all in for 63,700 total. The big blind called. Worldwide John would need a diamond to stay alive holding [ad][3d] against his opponent's [kd][qs]. 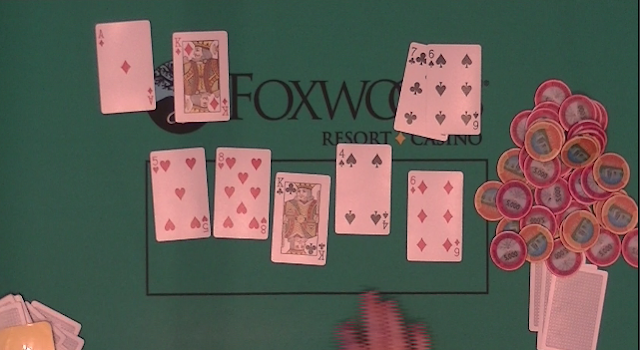 The [2c] turn was of no help, but the [qd] on the river gave "Worldwide John" the flush he needed to stay alive. He is now sitting with 180,000 right before the bubble. There are 28 players left and they are on the bubble, playing hand for hand. 27 players are guaranteed a min cash of $2,910. Christopher Pustelnikas limped in from under the gun, the player on the button also limped, and the player in the big blind shoved all in for 100,000. Pustelnikas called the all in and the player on the button also called. Pustelnikas had both players covered. Pustelnikas maintained the lead when the flop came [10d][9s][2h], but it also gave the player on the button an open ended straight draw. Luckily for Pustelnikas the turn came the [6c] and the river the [6s] eliminating both of his opponents and chipping Pustelnikas up to 260,000. With blinds at 100/200 with a 25 ante, a player limped from under the gun. Billy Pappas made it 600, and the player in the big blind as well as the player under the gun both called. The flop came [3h][2h][2s]. The player in the big blind as well as the player under the gun checked, and Pappas made it 800. Only the player in the big blind called. Both players checked the [3s] turn. When the river came the [5s], the player in the big blind check-called a bet of 2,100 from Pappas. "The Original" Billy Pappas turned over [3d][6h] for a full house, and his opponent mucked his hand. Pappas is now sitting at 27,000. Elvis Reyes limped in in early position. A player in middle position made it 4,800. Carlo Sciannameo called on the button, as did Reyes. The flop came [ac][js][8h]. Reyes checked, the player in middle position checked, Sciannameo bet 6,700, and both players called. The turn came the [8c]. Reyes and the player in middle position again checked, Sciannameo bet 20,000, and only Reyes called. Reyes checked the [2c] river, Sciannameo bet 35,000, and Reyes called. Reyes turned over [as][qh], and Sciannameo threw his cards into the muck face down. Reyes is now sitting with just around 200,000 in chips. There were 142 entries in Flight A and 118 in Flight B of Event #11, bringing the grand total to 260 entrants. After a chop deal was made between the final two players and only a handful of hands played heads up, Patricia Moody became the title holder and trophy winner of Event #10. After only a few hands of heads up play, Liz Kasparian shoved all in and was called by Patricia Moody. The board ran out [7s][5s][5h][6c][jd] sending Kasparian home in second place. Liz Kasparian shoved all in from the small blind, and Debbie Juda called for less. Kasparian was in the lead when the flop fell [as][6d][kh]. When the [10c] came on the turn, Kasparian had won the hand with her two pair, and the [8h] on the river became inconsequential. Juda was sent home in third place with a $2,508 payday. Patricia Moody called on the button and Linda Swears shoved all in. Moody quickly called. 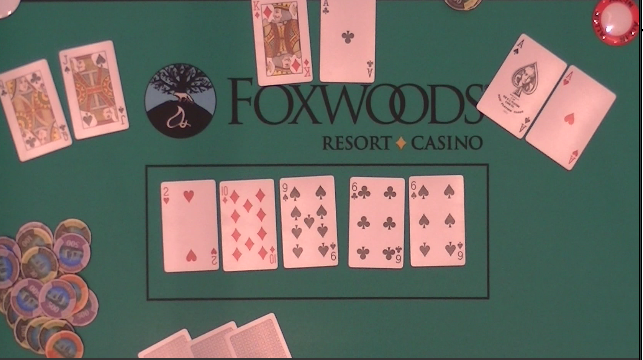 Swears maintained her lead when the flop came [kc][qs][8c], giving her a pair of queens. The turn was the [9c]. But the [10d] on the river gave Moody the straight and Swears was eliminated in 4th place. Nancy O'Neill shoved all in from the small blind and Patricia Moody called in the big blind. The board ran out [7h][4s][4d][ah][5d], sending O'Neill home in 5th place.